English local government is in a state of decline after 40 years of incremental but cumulative centralisation by central government. This book is the first to directly address this trend's impact upon the institution of local government, a crucial element in the democratic viability of a unitary state. The process of centralisation, and its corrosive effect on the status and responsibilities of local government, have been widely recognised and deplored among politicians and senior officers within local government, and by academics with an interest in this field. However, there has been no study exploring in detail its impact, and, equally important, suggesting ways in which the growing imbalance between the powers of central and local government should be rectified. This book fills this gap. 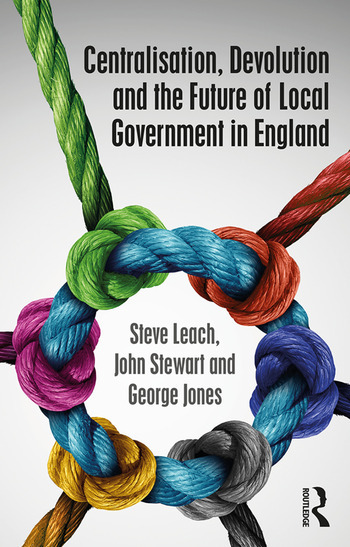 This text will be of key interest to scholars, students and practitioners of local government, and more generally to those interested in what has been happening to British politics and governance. Steve Leach worked at the Institute of Local Government Studies (INLOGOV) from 1977 to 1996, by which time he held the position of Reader. He was then appointed Professor of Local Government at De Montfort University, UK, a position he held until his retirement in 2009, and still holds on an Emeritus basis. John Stewart joined the Institute of Local Government Studies (INLOGOV) at the University of Birmingham, UK, in 1966, and became Professor of Local Government in the early 1970s, a position he held until he retired in the late 1990s, and now holds on an Emeritus basis. He was a member of the Layfield committee on Local Government Finance (1974-1976), and has contributed to many other government inquiries. George Jones joined the London School of Economics (LSE) in 1966 and was appointed Professor of Government in 1976, a position he held until his retirement in 2007 and which he later held on an Emeritus basis. He, too, was a member of the Layfield Committee and gave evidence to a range of other government inquiries.